What is Crypto Technical Analysis? Looking for a New Crypto Trading Platform? Go to Trading Platforms Reviews. What is Crypto Technical Analysis ? Crypto Technical Analysis is a tool that traders use to identify price trends. It helps them figure out how the market behaves, providing a sound basis for smart trading choices. Although it may sound complicated, it is nothing more than analyzing the demand and supply in the desired market. Technical analysts look to identify patterns in the price change throughout history. Based on the existing statistics, investors make an assumption on the future price and come up with a trading decision. Chart investigation is a crucial part of any crypto technical analysis. You can identify trends by keeping track of moving averages, support and resistance levels, and trading volume. There are two main types of tech analysis that every crypto trader should employ on a daily basis. Their concepts are quite simple but the implementation is what differs successful investors from others. A basic tool for crypto technical analysis is the bar chart. From one bar in the chart you will get information regarding open price, close price, highest price and lowest price within the selected time frame represented by the bar. A screenshot from Bitmex where you can see a green and a red bar in the chart. 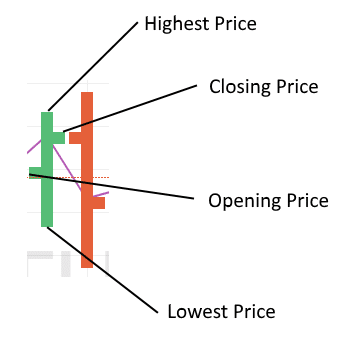 A green bar indicates that the close price is higher than the open price and vice versa regarding a red bar. Candlesticks are the most common graph type in technical analysis. The purpose of candlesticks is to identify trends and trend lines. Candlesticks contains the same information as the bars but looks different graphically. A screenshot from Bitmex where you can see a green candlestick and a red candlestick in the chart. Other chart types often provided are Hollow Candles, Heikin Ashi candles, Line, and Area. However, we will not cover these chart types in this basic article. Both Binance and BitMEX do offer all these chart types for free in the trading screen. Moving average is one of the most common technical indicators. You calculate this over a certain time period. If you are looking for the 30-day moving average you sum the last 30-days closing price and divide it by 30. This is a trend-following momentum indicator. It is calculated as a relationship between two moving averages. MACD is calculated by subtracting the 26-period Exponential Moving Average (EMA) from the 12-period EMA. This technical indicator is a momentum indicator to evaluate if the underlying asset is overbought or oversold. Relative strength index measures the magnitude of recent price changes and is displayed as an oscillator that can have a reading from 0 to 100. An oscillator is a graph that moves between two extremes. This is a technical trading momentum indicator that uses volume flow to predict changes for a cryptocurrency. This is also a volume-based indicator that is designed to measure the underlying demand and supply. The purpose is to indicate whether buyers are accumulating or distributing the underlying asset or cryptocurrency. This technical indicator is used to measure the strength of a positive, or negative, trend. The negative trend is called Negative Directional Indicator (-DI) and the Positive Directional Indicator (+DI). Therefor, ADX includes three different lines. This is a momentum indicator that compares a particular closing price of its prices over a certain period of time. The sensitivity of the indicator to market movements is reducible by adjusting that time period or by taking a moving average of the result. The indicator generates overbought or oversold trading signals with a value between 0-100. Both Binance and BitMEX do offer all these technical indicators for free in the trading screen. It is critical to have the opportunity to see the crypto technical graphs in different time intervals. The charts are often seen in minutes, hours, days, weeks, or months. The time interval you should use depends on what time horizon you invest for. Both Binance and BitMEX do offer all these time intervals for free in the trading screen. Some basic elements in crypto technical analysis are trend lines, support levels and resistant levels. Crypto technical analysis drawing tools are critical to find these trend lines, support levels and resistance. Other important drawing tools are pitchfork, Fibonacci circles and spirals, XABCD pattern, Triangle Pattern, Head and Shoulders, Elliott Impluse and Triangle Wave, Date range, Price range and more. Both Binance and BitMEX do offer extensive drawing tools for free in the trading screen. In this article we went through which crypto technical tools you need to perform a technical analysis. We found that two of our favorite crypto trading platforms, Binance and BitMEX, offer all these features for free, where you dont have to buy additional technical analysis software. Technical analysis is crucial for traders to have success when investing in cryptocurrencies, as shown by this article. There are many platforms that offer the service in terms of charts, data indicators, and API tools. These instruments gather data and translate it into information for you. Yet, we do need to emphasize the importance of your own involvement. At the end of the day, you are the one with a final decision on when and how to trade. Thus, you should not rely 100% on programs but use your own knowledge and experience as well. We continuously publish free crypto technical analyses in our blog.